Using an innovative multi-echelon “Position, Protect and Pull” approach, DDMRP helps plan and manage inventories and materials in today's more complex supply scenarios, with attention being paid to ownership, the market, engineering, sales, and the supply base. It enables a company to decouple forecast error from supply order generation and build in line to actual market requirements, and promotes better and quicker decisions and actions at the planning and execution level. DDMRP is already in use by MAJOR Global 1000 companies. 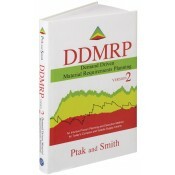 This book is THE definitive work on DDMRP, and will be required as courseware for all those taking the Certified Demand Driven Planner (CDDP) Program.